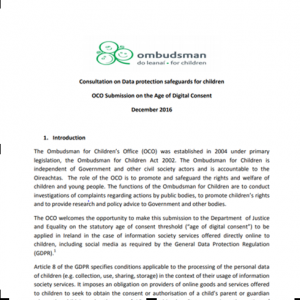 In December 2016 the OCO prepared a submission to the Department of Justice and Equality on the age of digital consent to be applied in Ireland in the case of information society services offered directly online to children, including social media, as required by the General Data Protection Regulation (GDPR). This regulation will come into force across the EU on 25 May 2018. Included in this submission are recommendations outlining why the lower age of digital consent of 13 should be adapted; that the Department of Justice and Equality should engage in a meaningful consultation with children and young people on the age of digital consent; that the Department of Justice and Equality should consider the recommendations made in the Law Reform Commission Report on Harmful Communications and Digital Safety to establish a new statutory national oversight system that would promote and support positive digital safety; and that any future legislative initiatives and criminal law reforms in the area of digital safety affecting children should involve child rights proofing at the earliest possible stage. We also expressed the view that education is the most important and effective protective measure to combat the risks of digital technologies and its impact on the rights of children to be protected from harm and from all forms of sexual exploitation and sexual abuse. I'm aware that the OCO can only deal with issues in the Republic of Ireland.